The army behind Libya‘s UN-backed government has announced a counteroffensive to defend Tripoli, vowing to reclaim all areas seized by forces loyal to renegade General Khalifa Haftar, who have been marching on the outskirts of the capital. Colonel Mohamed Gnounou told reporters in Tripoli on Sunday that the counteroffensive, dubbed Volcano of Anger, was aimed at “purging all Libyan cities of aggressor and illegitimate forces”. 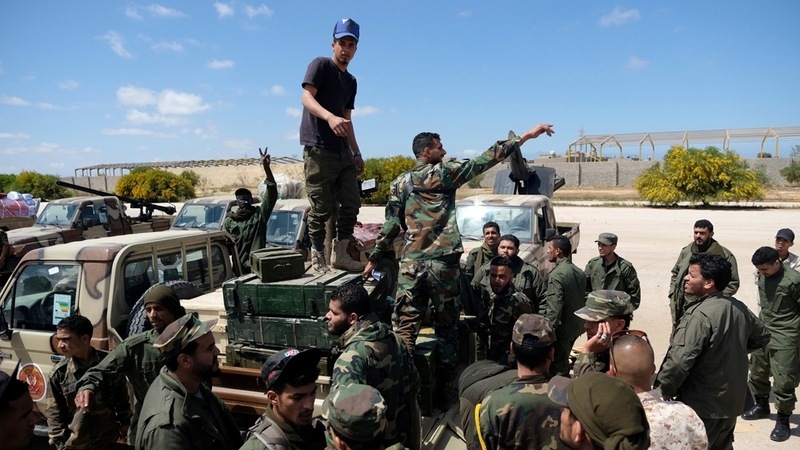 The announcement came as Haftar’s forces said they conducted the first air raid on a Tripoli suburb as part of their aim to overthrow the internationally-recognised Government of National Accord (GNA) and take control of Tripoli. The alleged attack came after GNA forces launched air raids on Haftar’s self-styled Libyan National Army (LNA) around 50km south of Tripoli on Saturday, reportedly killing one person. The health ministry of the UN-backed Libyan government said on Sunday that clashes in the southern part of Tripoli resulted in 11 killed and 23 wounded. Meanwhile, the UN mission in Libya (UNSMIL) made an “urgent appeal” for a two-hour truce in the southern suburbs to evacuate the wounded and civilians caught in the fighting. The European Union’s foreign policy chief, Federica Mogherini, who spoke to UN special envoy to Libya Ghassan Salame on Monday, said Europe’s message should be for “a full implementation of the humanitarian truce … and to avoid any further military action and escalation and a return to the political track”. Fearing that large-scale fighting could break out, the city’s residents have begun stocking up on food and fuel. Some 2,200 people had already fled fighting south of Tripoli since April 4, the UN humanitarian office said in a new report. “The civilian population in some combat-affected areas are unable to flee the area and emergency services are unable to reach them,” the report said. “The fast increasing deployment of forces could potentially result in significant population displacement,” it said. The health ministry of the Tripoli-based government said in a statement that at least 21 people were killed, including a doctor, and 27 others were wounded. Ahmed al-Mesmari, a spokesman for Haftar’s forces, said on Saturday that 14 troops were killed. It did not detail how many military personnel had been withdrawn. US Africa Command, headquartered in Stuttgart, Germany, said its mission in Libya involves “military support to diplomatic missions, counterterrorism activities, enhancing partnerships and improving security across the region”. It said it would “continue to monitor conditions on the ground in Libya and assess the feasibility for renewed US military presence as appropriate”. On Saturday, the head of the GNA accused Haftar of “betraying” him after the latter launched his military offensive on Tripoli. In a televised speech, Fayez al-Sarraj said Haftar’s forces would meet firm resistance from forces loyal to the GNA. “We have extended our hands towards peace but after the aggression that has taken place on the part of forces belonging to Haftar and his declaration of war against our cities and our capital … he will find nothing but strength and firmness,” al-Sarraj said. He also warned of “a war without winners”. Jason Pack, the founder of consultancy organisation Libya Analysis, argued that the goal of Haftar’s offensive was not to capture Tripoli but make a statement before a UN-sponsored national conference scheduled for later in April. “It is a media conflict. Haftar is posturing before the national conference. He’s parading his troops, he’s making a few air strikes here, trying to control some strategic points but not trying to conquer the city by force as he’d like to have us believe,” Pack said. “I think that the UN and the international community has doubled down on this conference, that they’re not going to be swayed by violence and spoilers and that they have a plan. Previous articleBrandon Reynolds, 36, allegedly killed his daughter Friday.